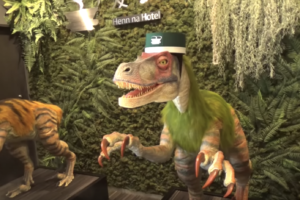 “We have a T-Rex!” Take it back to Jurassic Park at this hotel run by robot dinosaurs. Japan is a leader in robotics technology and Henn na Hotel showcases the country’s innovation. When the hotel opened in 2015, it was the world’s first hotel staffed by robots. Since then, many of the features that were cutting edge — robots who vacuum halls or turn on lights — have become more and more commonplace, but that doesn’t mean this hotel is any less a unique treat. When you arrive at the hotel, a multilingual robot greets you and takes care of check-in. Since it can be a challenge for robot dinosaurs to handle a customer’s lost key card, the hotel designers have opted for a face recognition software to get you into your room. The hotel is decked out with jurassic foliage, an aquarium of fish robots, and baby robot dinos wandering around the floor. There’s also a robot recycling bin, vending machines that prepare your food for you before serving it to you, and a robot “bellboy” that takes your luggage to your room. Because so much of the staff doesn’t require a wage (believe it or not, robot dinosaurs aren’t protected under the minimum wage law), the hotel maintains reasonable prices even being in the heart of Tokyo. A night’s stay regularly costs 92 USD. Whether you’re headed to a hotel run by robot dinosaurs or the actual Jurassic Park, the NOMATIC travel bag has you covered.